Seeking an upgrade at running back, the Vikings took Foreman in the first round of the 1973 NFL draft (12th overall). In college, he had played in the defensive backfield and at wide receiver as well as running back and excelled, setting school records for total yards, scoring, touchdowns, and kickoff return yards. As a rookie in ’73, he rushed for 801 yards on 182 carries, caught 37 passes for 362 more yards, and received Rookie of the Year as well as Pro Bowl honors. Vikings went 10-4 to finish first in the NFC Central. Won NFC Divisional playoff over St. Louis Cardinals (30-14) and NFC Championship over Los Angeles Rams (14-10). Lost Super Bowl to Pittsburgh Steelers (16-6). 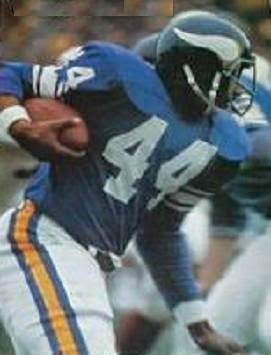 Foreman was selected to the Pro Bowl in each of his first five seasons and received first- or second-team All-NFL honors every year from 1974 to ’77. Outstanding as a receiver out of the backfield as well as a ball carrier, Foreman totaled over a thousand yards from scrimmage in each of his first six years and had over a thousand yards in rushing alone for three straight seasons (1975-77). He led the NFL in pass receptions (73) and NFC in touchdowns (22) in 1975, and was league leader in TDs again in ‘76. His productivity dropped significantly after 1977 and he finished his career with the New England Patriots in 1980. Overall, Foreman rushed for 5950 yards on 1556 carries (3.8 avg. ), caught 350 passes for 3156 more yards, and scored a total of 76 TDs.